Everything you need to know – whether you’re in Earth’s eastern or western hemisphere – about the May 20 or 21 annular eclipse of the sun. Mark your calendar for Sunday, May 20, 2012. If you’re at just the right place in the western United States, you can watch an annular – or ring – eclipse of the sun on that day. It will be the first annular eclipse to take place in the mainland United States since May 10, 1994, and the next one won’t come until October 14, 2023. An annular eclipse happens whenever the new moon swings directly in front of the sun, blocking out all but the outer portion of the solar disk from view. This kind of eclipse presents an apparent ring of fire – really, the outer edge of the sun – around the moon in the daytime sky at mid-eclipse. 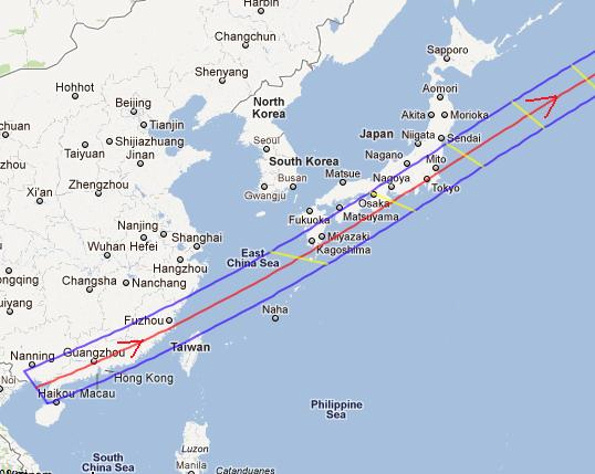 This same eclipse will be visible from China on May 21, 2012. See below for charts and eclipse times for both the eastern and western hemispheres! Map credit: Fred Espenak. Click here for a larger map and more information. In an annular eclipse, although the moon is crossing directly in front of the sun, the moon is too far away in its orbit around Earth to appear large enough in our sky to cover the sun completely. That’s why you get the ring or annulus – the outer edge of the sun – surrounding the moon silhouette. An annular eclipse is essentially a partial eclipse in the sense that the moon never blots out the sun completely. At no time can you gaze at the annular eclipse without protective solar filters to prevent damage to your eyes. From land, the annular eclipse is visible from a rather limited portion of the world. 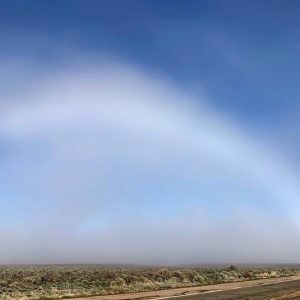 In the Western Hemisphere, it is seen in the southwestern part of the United States, during the afternoon hours on Sunday, May 20. In the Eastern Hemisphere, the annular eclipse occurs in far southeast China, far northern Taiwan and southeast Japan in the morning hours on Monday, May 21. Where to watch the annular eclipse in the U.S. 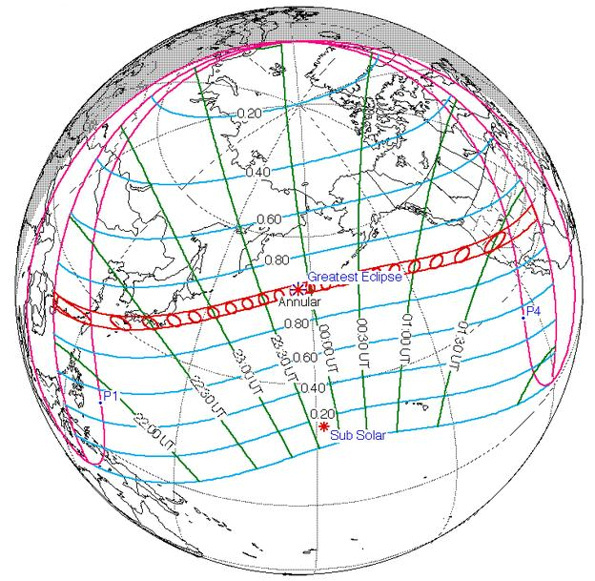 The maps above show the path of the annular eclipse across the United States and China on May 20 and May 21. The blue line outlines the northern and southern limits of the annular eclipse, while the red line marks the center. 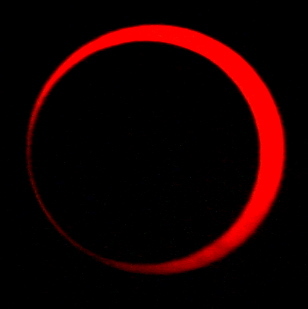 Annular or ring eclipse seen in Bangui, Central African Republic on January 15, 2010. Image via Tino Kreutzer and Wikimedia Commons. Here in the U.S., the annular eclipse will start in the relatively late afternoon on the west coast (6:23 p.m. Pacific Daylight Time) and will end at sunset over northwestern Texas (8:39 p.m. Central Daylight Time). Any one place on the eclipse path in North America will see the annular eclipse for a maximum of about four and one-half minutes. Proper eye protection is essential, even at mid-eclipse. As the annular eclipse moves eastward across the southwestern United States, it swings through popular vacation spots such as Reno, Nevada, Utah’s Bryce Canyon, Arizona’s Grand Canyon and Albuquerque, New Mexico. (We give the local eclipse times for these spots at the very bottom of this page.) The duration of annularity is rather short and sweet, even for observers on the red line. Take Albuquerque, New Mexico, for example, where the annular eclipse lasts for 4 minutes and 26 seconds. A partial eclipse of the sun precedes the annular eclipse by at least an hour, and follows it by roughly the same amount of time. Outside the path of the annular eclipse, the partial eclipse may be seen for two hours or more in the western parts of North America. Keep in mind, though, that for the most of the U.S. and North America, the sun will set in the west before the end of the eclipse. Elsewhere in the United States and North America, a partial eclipse of the sun can be seen from as far north as Alaska and northernmost Canada, and as far south as Hawaii and Mexico. The only regions in North America to completely miss out on the May 20 partial eclipse are the East Coast and far southern Mexico. During a partial solar eclipse, the moon isn’t quite in line with the sun, so it takes a bite out of the solar disk. A central eclipse, on the other hand, finds the moon and sun in direct alignment. Depending on the moon’s distance from Earth, the central eclipse can be either a total or an annular solar eclipse. During a total solar eclipse, the moon totally covers over the sun’s face. 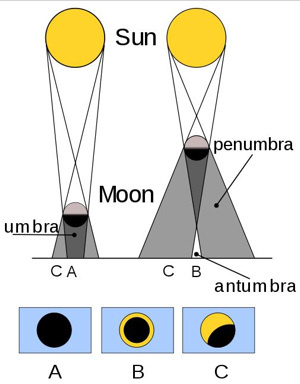 An annular eclipse, in contrast, finds the moon too far distant (and small) to totally cover over the solar disk, so an annulus – or ring – of sunshine encircles the dark silhouette of the moon. Annular solar eclipse ends: 6:27:09 p.m. Partial solar eclipse ends: 7:34 p.m.
Annular solar eclipse begins: 6:26:22 p.m.
Annular solar eclipse ends: 6:30:55 p.m. Partial solar eclipse ends: 7:36 p.m.
Annular solar eclipse begins: 6:28:31 p.m.
Annular solar eclipse ends: 6:32:54 p.m. Partial solar eclipse ends: 7:37 p.m.
Annular solar eclipse begins: 6:29:21 p.m.
Annular solar eclipse ends: 6:33:09 p.m. Partial solar eclipse ends: 7:38 p.m.
Annular solar eclipse begins: 6:33:59 p.m.
Annular solar eclipse ends: 6:37:12 p.m.
Annular solar eclipse begins: 7:31:28 p.m.
Annular solar eclipse ends: 7:35:46 p.m. Partial solar eclipse ends: 8:37 p.m.
Annular solar eclipse begins: 7:33:36 p.m.
Annular solar eclipse ends: 7:38:00 p.m.
Annular solar eclipse begins: 8:33:58 p.m.
Annular solar eclipse ends: 8:38:08 p.m.
annular solar eclipse begins: 6:07:42 a.m.
annular solar eclipse ends: 6:12:04 a.m.
partial solar eclipse ends: 7:18 a.m.
Annular solar eclipse begins: 6:06:46 a.m.
Annular solar eclipse ends: 6:10:13 a.m. Partial solar eclipse ends: 7:16 a.m. Partial solar eclipse begins: 5:07 a.m.
Annular solar eclipse begins: 6:10:17 a.m.
Annular solar eclipse ends: 6:11:29 a.m. Partial solar eclipse ends: 7:24 a.m. Partial solar eclipse begins: 6:17 a.m.
Annular solar eclipse begins: 7:28:23 a.m.
Annular solar eclipse ends: 7:31:16 a.m. Partial solar eclipse ends: 8:54 a.m. Partial solar eclipse begins: 6:19 a.m.
Annular solar eclipse begins: 7:32:05 a.m.
Annular solar eclipse ends: 7:37:09 a.m. 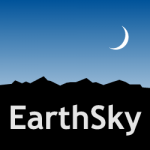 Partial solar eclipse ends: 9:03 a.m.
To know whether the eclipse is visible in your sky, and at what times, we provide you with two handy links. Click on this worldwide map, courtesy of the NASA eclipse web site, and scroll to where you live. Click at this spot on the map to find the eclipse times for your part of the globe. Or you can also use this Solar Eclipse Computer, courtesy by the US Naval Observatory, for finding eclipse times. Bottom line: A lucky few from China to Texas will be in just the right spot on Earth’s globe to see something special – an annular or ring eclipse of the sun. It will take place May 21, 2012 in China – and May 20, 2012 in the U.S. Yay International Date Line! 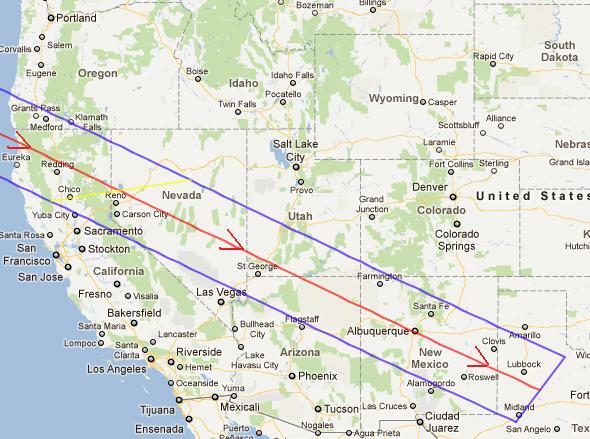 The annular eclipse path crosses it, moving eastward, and that’s why the dates are so different.